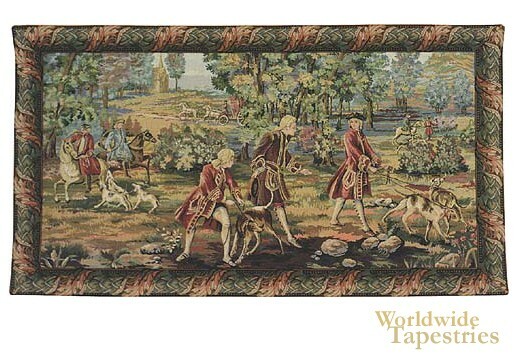 This landscape verdure tapestry "Louis XV Hunting I" shows a scene with the king of France hunting with his noblemen. This beautiful work shows the famous sport or past time of the royalty of France and indeed the rest of Europe in the 17th and 18th century. King Louis XV ruled France from 1715 until his death in 1774, having succeeded his grandfather to the throne at age 5, though his cousin Philippe served as regent until he was old enough of age. He had a famous mistress, Madame de Pompadour, which others know him for. However, he had a major influence on French art, through his intense passion for art, and the King Louis XV style has been named after the style he oversaw the decorative arts in Versailles. The Rococo style was developed at this time and was a development from the more stricter styles just before it. Here we see the king interacting with his men, as the hounds accompany them on their countryside hunt in the woods. This landscape verdure tapestry "Louis XV Hunting I" is backed with a lining and has a tunnel for ease of hanging. Dimensions: W 43" x H 24"